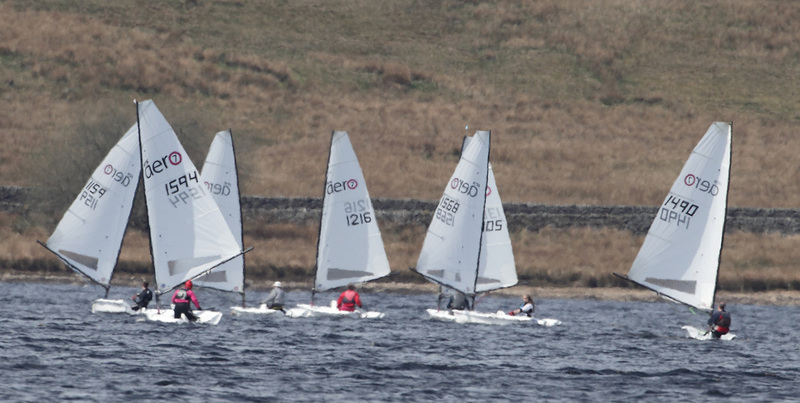 13 lucky Aero sailors arrived at the distinctly Mediterranean Yorkshire Dales Sailing Club on the 8th May 2016 for the inaugural RS Aero open meeting. The forecast of warm sun and wind producing a great turnout of local sailors and travellers from Scotland and the south. With the temperature at 24 degrees and a warm easterly blowing you only had to close your eyes to believe you were on the Cote d’Azur and not the hastily renamed Cote de Grimwith. The first difficult decision arose in the changing rooms as the frankly warm wind sent the local sailors searching deep into their bags for any suitable clothing, generally with no success. The visitors emerged looking cool with a variety of summery wear whilst the locals sweated it out in drysuits and steamers. The wind was a pleasant force 3 from the east allowing the race team to set a good long beat up the lake with a few detours downwind to keep the Aeros amused. Twelve 7 rigs and one 9 headed down to the start in beautiful conditions. Race 1 with the Aeros starting 5 minutes behind the club boats saw local Ed Storey leading the fleet to the windward mark only to have Alistair Scott (also YDSC) overtake on the downwind, Ed hiked harder upwind to re-establish the lead only for Ali to overtake again downwind, further down the fleet the chasing bunch was not far behind. At the finish it was Ali who took the race win. Race 2 was over the same course but with a very biased pin end line. Ed made the best of the port tack starters and crossed the fleet to lead up the beat, a position that this time he managed to hold for the duration to take the win, with Caitie Atkin (Whitstable YC) in 2nd. An excellent lunch was provided by the local catering team and space outside was at a premium as we all lapped up the rays. Race 3 was certainly fun with hard hiking upwind rewarded with full planing reaches downwind. The exact details of the race are lost in the mists of time however there were a lot of smiling faces. 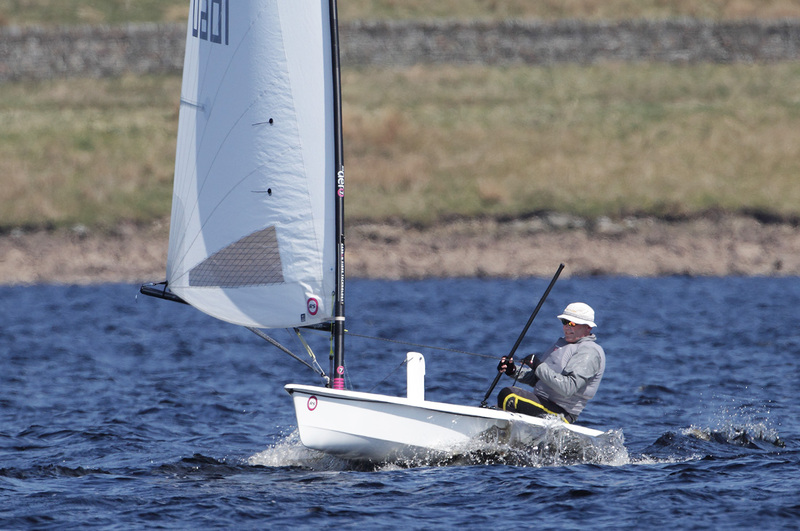 Race 4 saw a change at the front with Iain McGonigal (East Lothian YC) justifying his long journey down from Scotland with a storming start and first beat to lead by a good margin at the windward mark. He was certainly relishing the building breeze and extended his lead from the tight chasing pack for 3 long laps and looked to have the race won however a momentary lack of concentration 100 meters from the final mark saw him test the temperature of the water which he can confirm was “invigorating”. The leading chasers slipped past as he examined his inverted hull and he did well to recover to finish second. 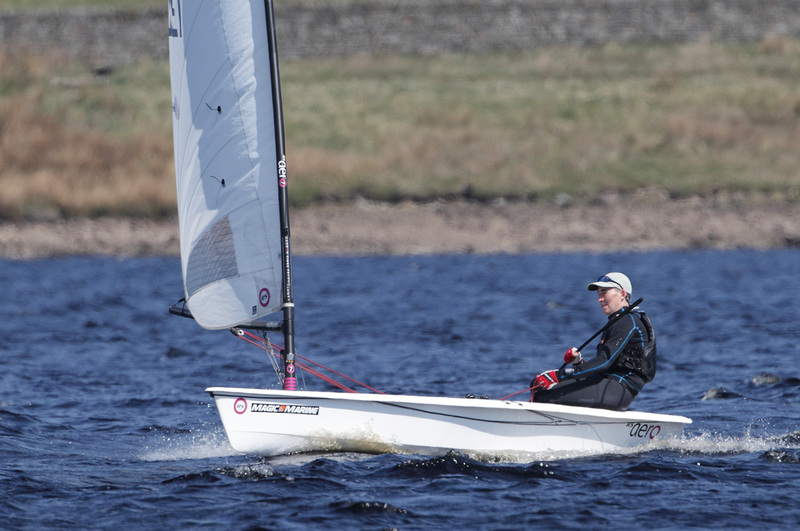 At the end of a fantastic days sailing it was sunburn, smiles and sore limbs all round with the overall win going to Ed, Alistair Scott in second and Iain McGonigal third. Caitie Atkin was first Lady in 4th. 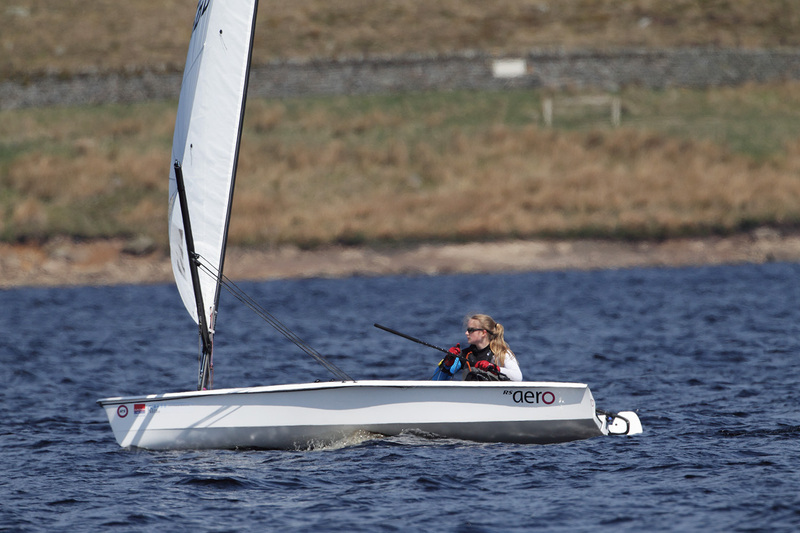 Many thanks to Yorkshire Dales SC for a great event, the friendliness, great facilities, superb sailing area and wonderful food were all commented upon and enjoyed and the RS Aeros look forward to returning to the Cote de Grimwith again next year. Next event on the 6 round Northern Circuit is the Filey Regatta on 16/17th July, always a great fun weekend with direct launching off the glorious Filey beach, see you there!